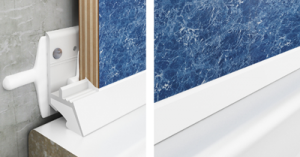 Did you know that the installation of a butyl adhesive upstand sealing strip around a shower tray or bath does not meet the recommendations of BS 5385:2015 Part 4 ? BS 5385:2015 Part 4 was published in October 2015 and Section 7 dealing with ‘wet and damp conditions’ advises that: in areas not subject to continuous water immersion but subject to frequent wetting, the basic structure behind the tiles should be watertight. 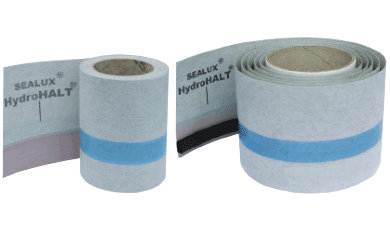 Consequentially, the provision of tanking kits for waterproofing shower walls has become a staple ‘surface preparation’ product in the market and as one might guess with so many suppliers about – buyer beware, waterproofing kit contents can differ from box to bucket! The process of waterproofing a wall over a shower tray or bath throws up the technical challenge of sealing the wall membrane to the shower tray or bath in a manner that will withstand the depreciating effect of the shower environment and the stress created by joint movement. The plumber’s default solution, regardless of waterproofing the shower walls or not, is to install a high tack butyl adhesive upstand strip. 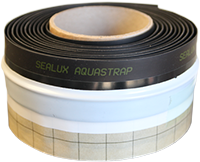 Did you know the butyl adhesive upstand sealing strips currently promoted by tile adhesive manufactures, shower tray manufactures and others including Sealux do not comply with the revised British Standard 5385:2015 Part 4.7 ? It should be understood that butyl adhesive is a non-curing sealant. 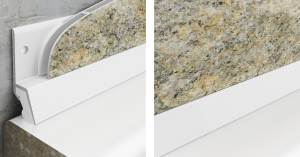 The use of butyl adhesive on an upstand strip as a sealant to seal a movement joint around a shower tray or bath does not meet the recommendation of BS 5385 Part 4.7.2.4 which states that movement joints subject to water immersion, water spray or splash, should be sealed with curing sealants. While compliance with BSI recommendations is not a legal requirement, meeting their benchmarks in respect of installation practices is seen as a hallmark of excellence. Can you prove ‘fitness for purpose’?